We love chocolate. I mean really love chocolate. In our store, we make chocolates on a regular basis and we try to find unique flavor combinations and ingredients to combine into something wonderful. Not all of our attempts of course succeed, but with each attempt we learn something that allows us to make our next experiment succeed. Failure in the kitchen can be as informative and educational as each success. What we plan to do over the next few months is provide a basic primer and introduction into chocolate making that we hope will allow you to experiment and enjoy the process of working with the “Food of the Gods”. Our first post is all about choosing what chocolate to use. The first and most important part of making any food product is choosing the right ingredients. This is especially true when working with chocolate as not all chocolates have the same quality, flavor profile, and can be used for all applications of chocolate making. 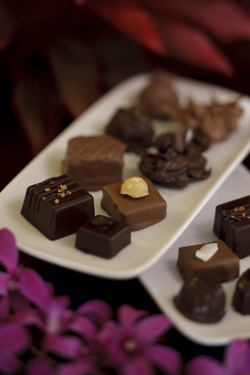 Here are some tips or suggestions for how to choose chocolate to use at home. Many people love truffles. 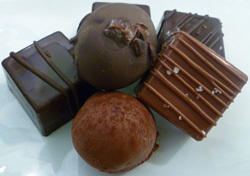 We sell more truffles in our store than any other type of chocolate. Our customers love our soft velvety centers covered in dark or milk chocolate. When making any confection requiring dipping or coating in chocolate, it is important to get a chocolate with a higher fat content. This is called Couverture Chocolate. This type of chocolate is formulated with a higher percentage of cocao butter in it so that when you dip something with uneven surfaces the chocolate will adhere better and set up better. If you use regular chocolate, with a lower percentage of cocao butter, your chocolate will likely crack or you may even see leaks from the center you have dipped. There are ways around using Couverture by adding additional cocoa butter to your chocolate as you are tempering it, but for home chocolate makers we do not recommend this. If you are unable to location this type of chocolate where you live, contact us and we can ship some of ours to you. Key thing to remember, Couverture chocolate is 32-39% Fat by weight. Buy what you like. If you like high cacao mass dark, buy it. If you prefer milk, buy that. For the purposes of these posts, we will only be using white for some truffle centers and for decoration ideas. When thinking about the type of chocolate you want, check the ingredients. To us, dark chocolate should never contain any dairy ingredients. What you would expect to see are ingredients like chocolate (cacao mass, chocolate liquor, cocoa butter, chocolate mass), cocoa butter, sugar, vanilla, and usually soy lecithin (emulsifier). There should be nothing else and please never buy anything with vanillin, which is an artificial vanilla flavor. Dark chocolate containing sugar as the first ingredient means there is at least 50% sugar and that makes it sweet and very unhealthy. (See our earlier post on healthy chocolate). We prefer using higher cacao mass dark chocolate for all of our products. We never use anything less than 60%. Contains contain sugar, chocolate liquor, cocoa butter, milk (cream, dairy ingredients, milk fat) and flavors. Milk chocolate must contain at least 10 percent chocolate liquor and 12 percent milk solids to meet the US standard of identity. The only fats allowed in milk chocolate are cocoa butter and milk fat. Due to the inclusion of milk products and the low percentage of cacao mass (chocolate), milk chocolate is not something to eat in order to obtain any health benefits. Stick with high cacao mass dark chocolate! Remember, choose the chocolate you enjoy eating to work with when making chocolates. 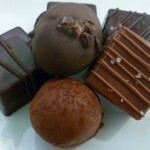 Try different chocolates or even consider blending a couple chocolates together you enjoy. As an option for our fans and followers, we can ship bulk chocolate to you if you are not sure what to use or are having a hard time finding bulk chocolate that meets your taste requirements. Just contact us for details at info@papalanigelato.com.